Mid bloomer. 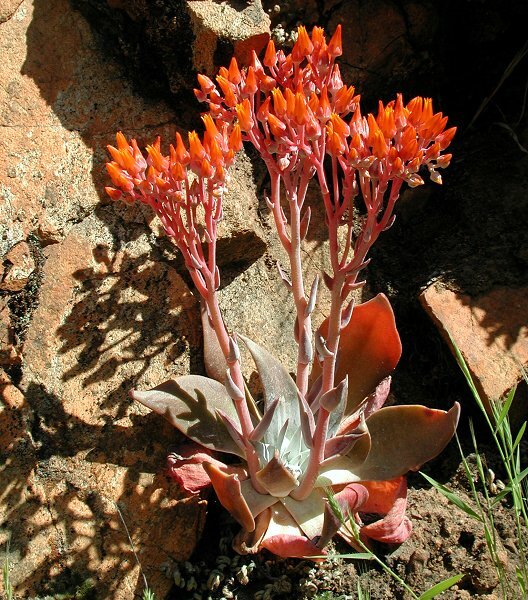 Red-orange stems, yellow flowers, succulent leaves, found on sunny rocks, rocky slopes. Also called Live Forever. Notes: Showy clusters of tiny yellow flowers on showy red-orange stems are favorites, as they attract people even from across the river who ask, "What are the red flowers?" It isn’t so much the flowers but the color of the stems and sepals. 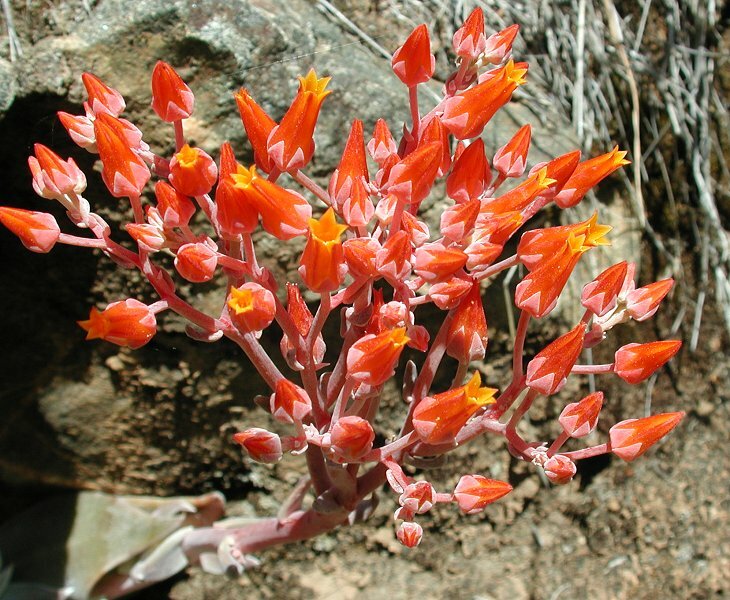 Varying in color from pale orange to bright red-orange, they are also easily seen, as they prefer rocky down slopes. 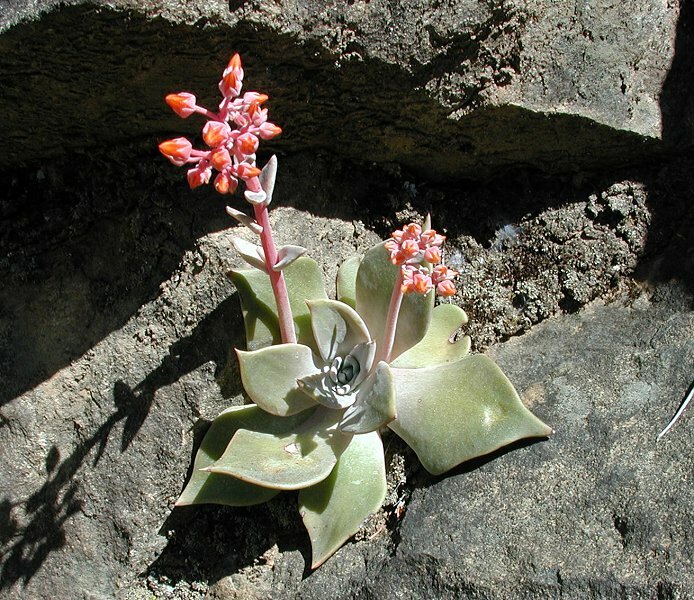 The stems arise from a lovely rosette of succulent leaves. By the end of summer they are usually quite withered but will engorge themselves again with the fall rains. Some species were known as "Mission Lettuce” because the fleshy leaves can be eaten raw and used in salads. There are 45 species, some of which are endangered through loss of habitat and theft of the plants. 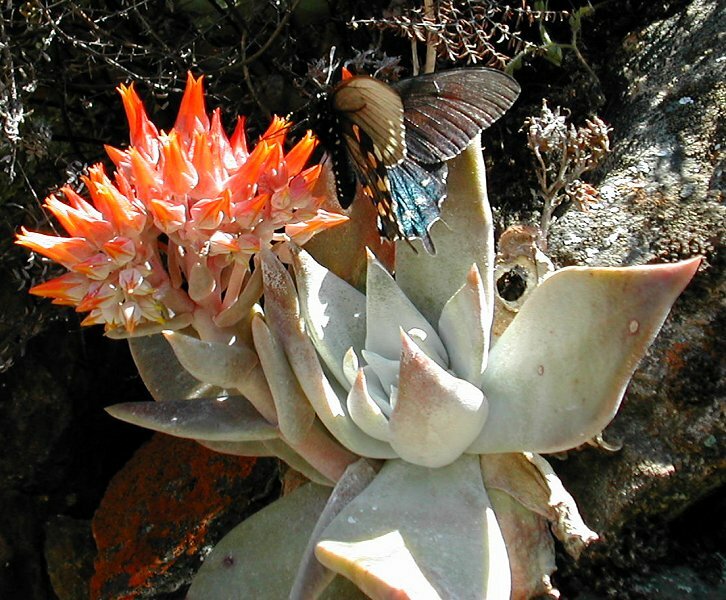 The USDA records for this genus list 29 species and 50 accepted taxa overall. W.R. Dudley was an early 20th century American botanist. Cymosa means bearing cymes in reference to the growth form of this plant. The Maidu saw them incredibly growing out of the rock hence, the name Live Forever.